Learn how to make these cute sock puppets into all kinds of fun animals. Making sock puppets is a great project for young girls just learning to craft. The PDF Version contains instructions and patterns for all animals shown in our photo. The Easy Print PDF Version contains instructions and patterns for all the animals shown; cow, sheep, horse, giraffe, mouse, snake, and dog without margins, ads or logos. Other optional items; yarn for hair, chenille sticks, etc..
Part of our sock puppets require that you can hand sew a basic up and down stitch. Although the decorating of the puppets can be done by older kids, the base of the puppet should be done by an adult or someone who can sew a basic handstitch. Have some sewing pins available for this step. Place the sock on your hand with the heel of the sock at your knuckles and the toe hanging out beyond your fingers. Open your hand so that your thumb is below your other fingers as if opening a puppets mouth. Without changing the position of the mouth, carefully take the sock off your hand. Using an up and down stitch, stitch a simple triangle at each side of the puppets mouth as shown in the photos. Put your hand back into the puppet and get your marker. Make marks at the locations for the eyes, nose, ears, and other parts of the animal you are making. Take the puppet off your hand. Using the pattern provided for the gluing base cut out the gluing base from a cereal box. Fold where the rectangular part meets the rounded part. Slip the foam mouthpiece into the puppet mouth without glue first to make sure it will fit correctly. It should fit inside the puppet's lower mouth with the front edge of the foam, at the front edge of the puppet’s lower mouth. Remove and trim if needed. Add hot glue to one side of the mouthpiece and insert it into the mouth, then quickly press down into place. Glue the eyes, nose, and tongue if you have one onto your puppet. Depending on what type of animal you are making, you may want to pull the cardboard gluing base out and put it back in sideways so you have a flat surface to glue against for the ears that are attached on the sides of the head, such as a dog like ours. 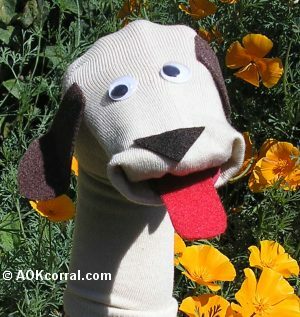 These sock puppets are a terrific and inexpensive craft to make for your kids, for a child's gift, or for your churches' Sunday school group or school classroom. The Easy Print Version includes instructions and patterns for all the animals shown; cow, sheep, horse, giraffe, mouse, snake, and dog without margins, ads or logos.